Washing laundry is a common and almost constant task. You clean up clothing, towels, bed sheets and shoes at least once a week. Every time you move laundry from the washing machine into the electric drier, you also transfer some of your budget to those energy bills. Should you find the best clothes drying racks to save some space and money? Air drying your clothes indoors may seem traditional and grandma-like. However, more and more customers now turn to racks for their traits. Meanwhile, manufacturers develop products using technology and high-quality components. Drying your clothes as such protects their materials while keeping them away from damaging sunrays. Drying laundry on the rack takes space temporarily, as you can usually fold the racks after use. Yet, can they hold your massive laundry quantity? Here are the 5 best clothes drying racks to buy in 2018 which might become your reliable household cleaning fellows. The rack’s design resembles classical drying racks and takes about the same space. If you love that type of design, you can research more and compare options. These types of racks now offer more storage possibilities than classical ones. According to manufacturers and buyers, it can fit about two wash loads. This is one of the best clothes drying racks thanks to its sturdiness and durability. Dimensions: 42.3 x 23.2 x 2.7 inches. The best clothes drying racks offer more than just the possibility to dry your clothes electricity-free. This product is made of stainless steel which ensures stability and protects it from rust. The heavy-duty product comes with removable hooks for shoes. The rack can fit two medium wash loads or a large one. It’s also surprisingly lightweight for its capacity. 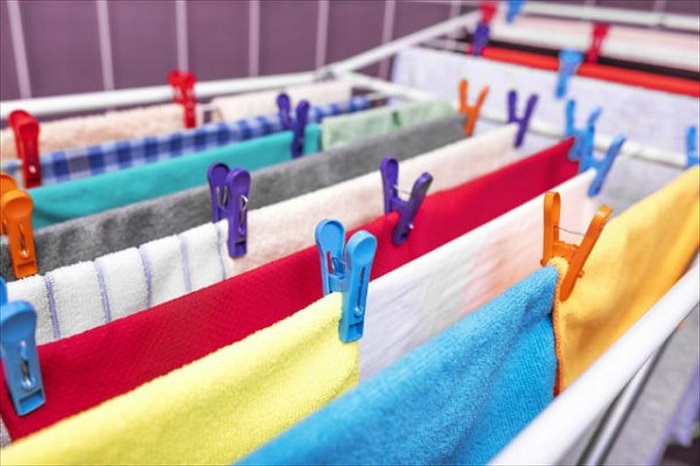 Although you cannot add any type of clothespins, it works perfectly for all types of laundry. Drying space: 2 levels of racks, 4 foldable hooks. Dimensions: 58 x 24 x 40 inches. Drying racks with wheels are easy to carry outdoor for some natural air drying or to just move around the house. The rack is made of tubular steel and has a white stylish finish. It’s easy to set up and fold after use. This product has an extra mesh rack for delicate garments who are usually difficult to dry. Drying space: 78 square feet. Dimensions: 49 x 24 x 54 inches. Are you looking for a classic-designed foldable clothes drying rack to save space and be able to organize your home? This product offers many possibilities and takes little space. It features 2 adjustable wings, a mesh shelf and 2 shoe racks. The drying rack can hold two medium or small wash loads or a large one. It’s also equipped with rubber feet to prevent floor scuffing or skidding. Dimensions: 21 x 15 x 32.2 inches. If your rooms are small and you wash rather often than a lot occasionally, you may have found the perfect product. The w-shaped drying rack sticks to your wall, expands when you need to dry clothes and folds back when not in use. The product is discreet and impressive, as it can hold up to 60 pounds of laundry. This rack also stands out from protecting laundry of wrinkles. It’s made of stainless steel to ensure durability. Dimensions: 9 x 6 x 35 inches. Technology develops, and researchers are studying the possibility to dry laundry in a cabinet using waste heat. Meanwhile, the end customer pays higher electricity bills due to the machine drier. Drying racks make a suitable and accessible alternative for those who constantly wash a lot of laundry. The main inconvenient of racks is that they slow down the drying process with a few hours. However, clothes are easier to iron so it compensates through easy after work. Also, during summer clothes dry quicker than usual. Drying racks protect clothes as they don’t expose them to the spinning that drying machines do. Also, they enhance textile freshness due to exposing them to air. They take up space temporarily and only need a few inches for storage. They are cheaper than drying machines and require less maintenance. Racks protect the environment as they don’t use electricity. Racks promote weight loss. Believe it or not, 15 minutes of hanging and removing laundry burn 68 calories. Cleaning your clothes is a process which lasts for a few hours and occurs at least once a week. However, using the best clothes drying racks saves you money and space. The time you spend waiting for the clothes to dry is an investment for easier clothes ironing. There are other advantages of drying racks waiting for you to discover.